I modded the fictional F-13 Draken from Spinners to make it look like a fictional fighter and recon plane for the portuguese air force. The original intention of the portuguese government was to equip 2 entire squadrons, the 201st and the 301st, with F-16. After another evaluation of the financial capabilities, one squadron could not be equipped with the Falcon. Saab, having just signed the contract with Mitsubishi for the licensed Draken, also offered Portugal the option for the license of this plane. 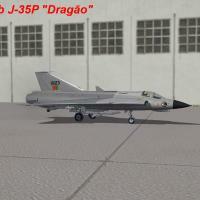 After doing some calculation, Portugal decided not to buy the license, but to equip the 301st sqaudron with an adapted Draken, which was then called "Dragão". Jug - Landing lights, Taxi lights, ECM, Flares and Chaff mod.